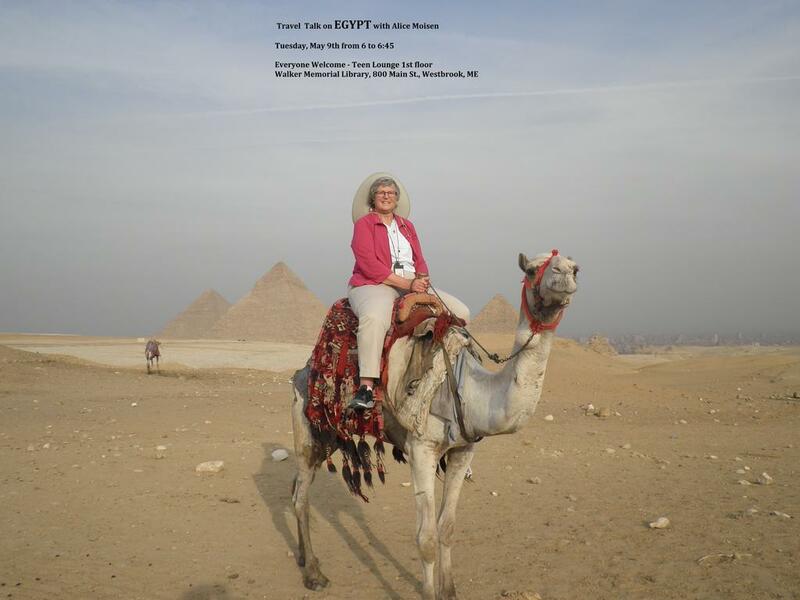 Alice Moisen, a travel photographer, will speak and show photos of her recent trip to Egypt at Walker Memorial Library on May 2. WESTBROOK — Student artwork is on display at Saccarappa Elementary School through Friday, April 28. The High School Art Show opens at 6:15 p.m. Tuesday, May 2, at the school. The show will continue through May 4. The Canal Elementary is scheduled for May 11-19. WESTBROOK — A concert, “Food Glorious Food” will be presented at 2 p.m. Sunday, April 23, featuring the voice students of Janelle LoScuito. The concert benefits Westbrook Food Pantry and is sponsored by Trinity Lutheran Church’s “Climb Aboard the Food Train.” The food train is a series of city-wide fund raising events for the food pantry. Donations of cash or non-perishable food will be accepted at the door. For further information, contact the church at 854-5653 or pastor@trinitywestbrook.com. WESTBROOK — An All City Chorus Concert, featuring all Westbrook School choruses, is scheduled for 7 p.m. Monday, May 15, at the Westbrook Performing Arts Center. WESTBROOK — Travel photographer Alice Moisen will share stories and photographs of her trip to Egypt this past year from, 6-6:45 p.m. Tuesday, May 9, at Walker Memorial Library. The event will be held in the Teen Lounge on the first floor of the library, 800 Main St.